Mr. Charles Tildesley, of Hamilton-st. Atherton, who has served on the staff at the Atherton Post Office for the past 45 years, retires to-day (Friday). When he commenced work as a postman the office was situated at No. 9, Market-st., and was later transferred to 86, Market-st. At the former premises Mr. Mackenzie was the postmaster, and at the latter Miss Shillabear acted as postmistress, In 1906 the present building was taken over and Mr. N. B. Boreham took over the duties of postmaster. There were then only five on the staff, as against 16 now, and there were two deliveries and two dispatches daily, one mail being taken to Manchester by horse and van. 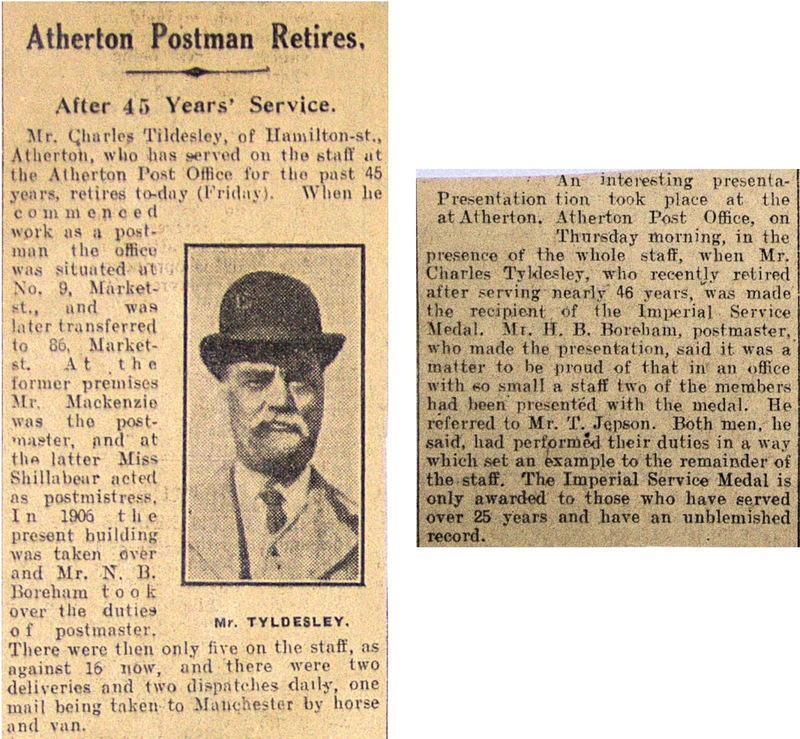 An interesting presentation took place at Atherton Post Office, on Thursday morning, in the presence of the whole staff, when Mr. Charles Tyldesley, who recently retired after serving nearly 46 years, was made the recipient of the Imperial Service Medal. Mr. H. B. Boreham, postmaster, who made the presentation, said it was a matter to be proud of that in an office with so small a staff two of the members had been presented with the medal. He referred to Mr. T. Jepson. Both men, he said, had performed their duties in a way which set an example to the remainder of the staff. The Imperial Service Medal is only awarded to those who have served over 25 years and have an unblemished record.